Set of components for developing modern looking and highly attractive applications in Windows7 style. Toolbar that you can see in the top part of the Windows Explorer window. Button located on TW7ToolBar. This button can be placed on any other object. 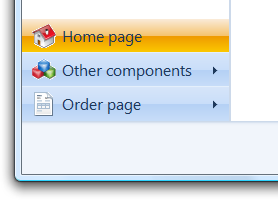 You can also add icons to it and use it for displaying a dropdown menu. Panel containing any kind of information. For instance, in Windows Explorer, this panel is located in the lower part of the window and displays brief information about the selected file and its icon. These objects can be used as switches between different pages of your program. They can substantially facilitate navigation between different areas of the application. 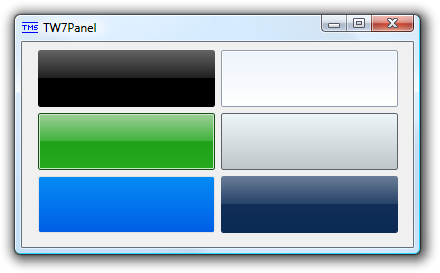 ProgressBar used for displaying the free disk space in Windows Explorer. This object works best if used as a hyperlink or an internal link. An empty ListView Item that can be used as a container for other components and can be placed on any object. 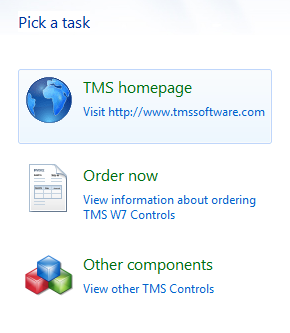 Based on TW7ListViewItem, this component should be used for selecting a task that the user must complete. 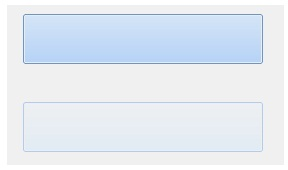 You can assign icons of various sizes to this component, as well as specify the name of the task and its short description. Button used for back/forward navigation. It is used in Windows Explorer and is located at the very top next to the path field. Graphic object for framing TW7NavigationButton. Panel usually located in the left and containing links to additional actions. TW7CaptionPanel Panel that usually contains a title and is located at the top. Panel that has a number of styles, including the style of the digits display window in Windows calculator and iPhone style. Button used, for example, in the Windows 7 calculator. It has several style options that are used in Windows. The button can also have icons and can be used for displaying a dropdown menu.